Francine Busby visited the Club for our meeting on January 27 and called on us to volunteer to help register new voters at the downtown Naturalization Ceremony on Wednesday March 20. The ceremony normally empties out of Golden Hall, 3rd Ave and B Street, in Plaza near Civic Theatre at ~10.15am and for about two hours volunteers led by Greg Bolian help new citizens register to vote. The atmosphere is always very positive with a lot of happy new citizens from all over the world, excited to start taking part in our great experiment in democracy – it’s inspiring to meet new, enthusiastic Democratic voters! The Club will be arranging a car pool to take members. If you want to make your own way there parking is no longer free at Horton Plaza (2 blocks away) you now have to make a $10 purchase to get validated parking. Street parking is available at meters or there are pay lots in the neighborhood. The 923 bus along Harbor Dr or the 30 from Old Town stop a block away on Broadway. The Car2Go electric cars can be left on any valid parking space, including meters. Training for new volunteers will be provided at ~10.00am. 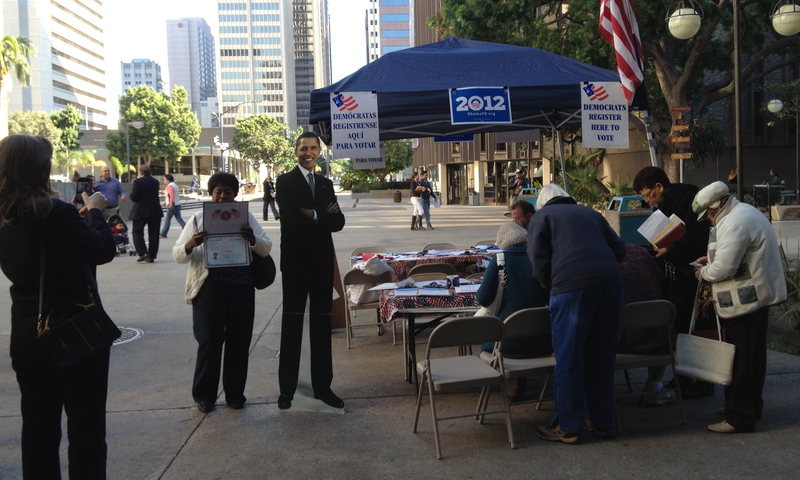 This is a fun thing to do; new citizens come out of the Civic Center and see our booth with Pres. 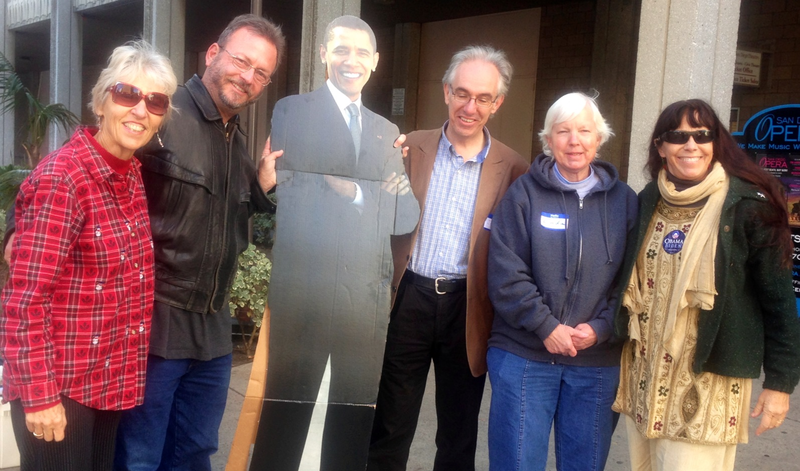 Obama’s lifesize cutout and flock over to have their picture taken; everyone is happy as it is a joyous occasion for the new citizen and their family. It’s easy to ask if they want to register to vote, and if they have time, many do. I recommend volunteering to help in registering new voters, so email the above names to get more information.